I'm always looking for and doing things for a cause , so when I come across others who have the same passion I get really excited. That's what happened when I came across T.H R.I.F.T 4 A Purpose on Instagram. It was inspiring when I looked closer and saw the meaning behind the InstaGram Tag. T.H.R.I.F.T (Transition Hope Restoration Improvement Faith and Transition)helping women across the world feel good about themselves going through an transitional time in their lives. I was so inspired to see another woman who uses thrifting in terms of a bigger cause. I reached out to her and wanted to share her mission with others. Shawn uses proceed from her online thrift resale to help women ,so it was fitting to give her a shout out in Women's History Month to highlight some of today's women helping women. My name is Shawn Cason I have been empowering women in that community and thrifting for over 10 years. I opened a consignment store here in Buffalo New York in 2012 where I gave free clothing to women in need for interviews and religious events. My passion has also been helping women being adopted and having a mother addicted to drugs. I' am also a employee at the Buffalo City Mission Women's Shelter where I assist the homeless community. 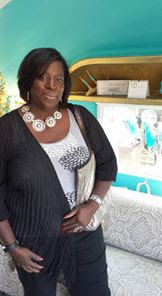 With my passion of thrift shopping I started T.H.R.I.F.T (Transition Hope Restoration Improvement Faith and Transition)helping women across the world feel good about themselves going through an transitional time in their lives. My Vision and business is reselling gently worn fashion items for women you can find my inventory on InstaGram @thrift_4_a_purpose & also @the_thrift_store_challenge. Some of the proceeds from my sales support my cause to also travel to third world countries and help women. If you find it in your heart to donate please contact us at thriftchallenge@gmail.com or shawnlloman@yahoo.com also by phone at 1-716-909- 0951.